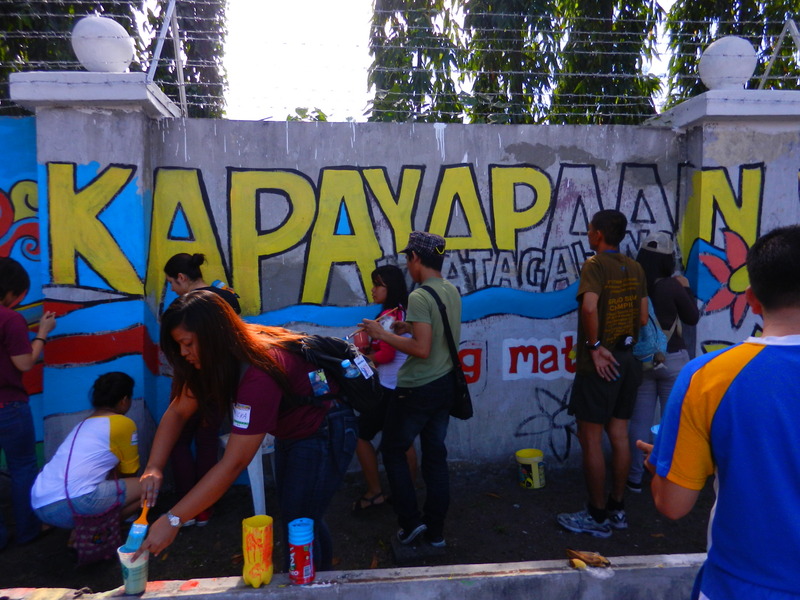 Volunteering is modern bayanihan and heroism in its sincerest form. As Filipinos, we take pride in our values because it reflects who we are as a people. We may recall our old tradition of community unity and participation through bayanihan, where neighbors would literally help carry your entire house to its new location. The values of helping each other and working together towards a common goal are deeply rooted in us, and it continues to manifest in present times. One fine Sunday, March 2, 2014, I volunteered to be part of the rummage sale at Bel-Air Village in Makati City. This is one of the fund raising projects of iVolunteer organization. It was a Clean UP! Flea Market activity inside the subdivision, the venue was at Park 3 Solar Street. From 7am to 3pm, mostly resident vendors sold pre-loved items which included clothing, shoes, bags, accessories, luggage, CDs, books, toys, household items and a lot more. There were over 120 non-food tables that filled the whole covered court. There were few food tables found on the side of the court for the shoppers and vendors. 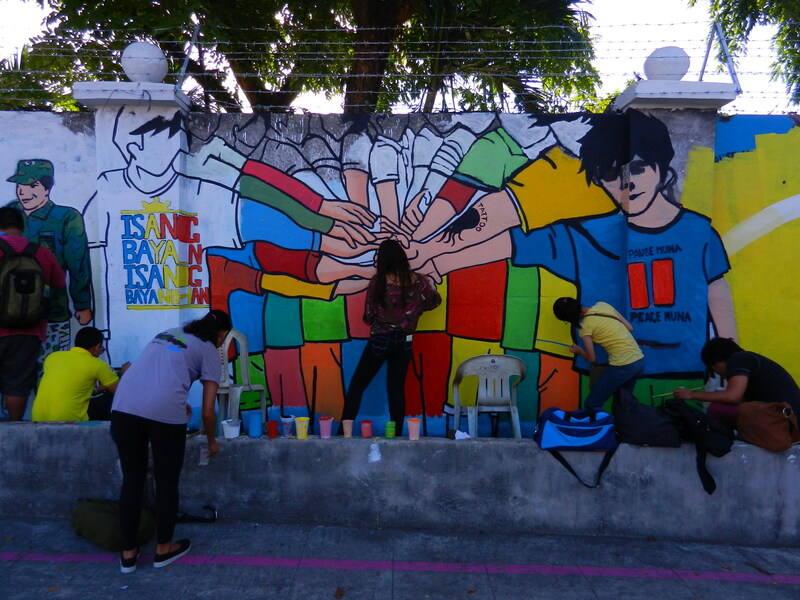 This week’s Throwback Thursday post stretches back to June of this year, during our Project EDSA peace mural painting activity at Camp Aguinaldo. 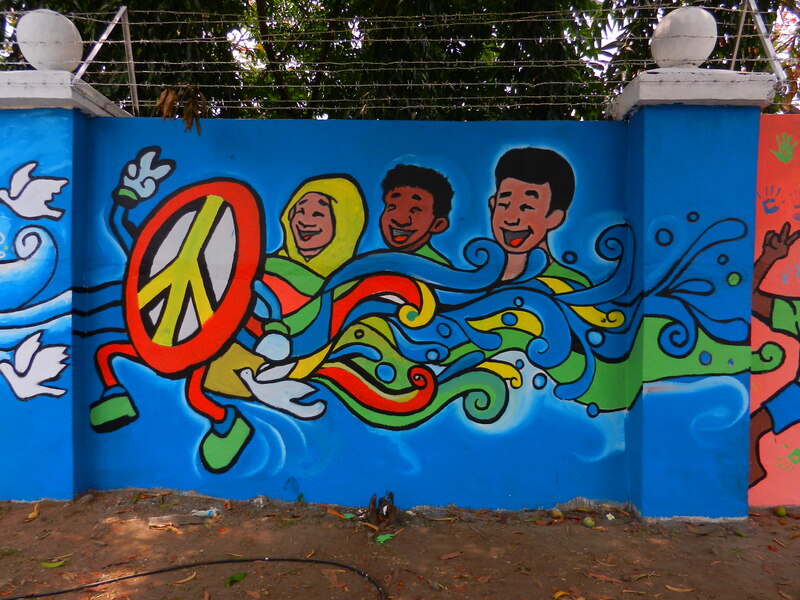 Author Lean Lava shares his thoughts on volunteering for peace in this well-written essay. Why volunteer? And more importantly why volunteer for peace? Something so conceptual, so hard to quantify, sustain, and promote, let alone volunteer for. Peace – everyone knows it won’t be easy. So why? The thought had occurred to me before I woke up early on a cool Sunday morning for the inaugural of Project EDSA’s Lakbay Para Sa Kapayapaan Sa EDSA. I arrived at the People Power monument at 6:30 am along with many other brave volunteers – 1,500 strong and ready to take on what would be a record-breaking peace mural surrounding Camp Aguinaldo. Unlike most of these volunteers, I wasn’t equipped with a paintbrush, a clean plastic cup for paint, or a firm belief in what I was doing there. 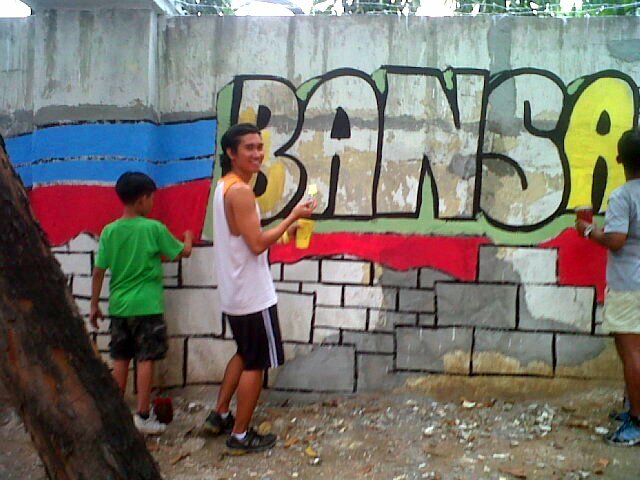 I was there simply as a laborer, come to paint a wall. 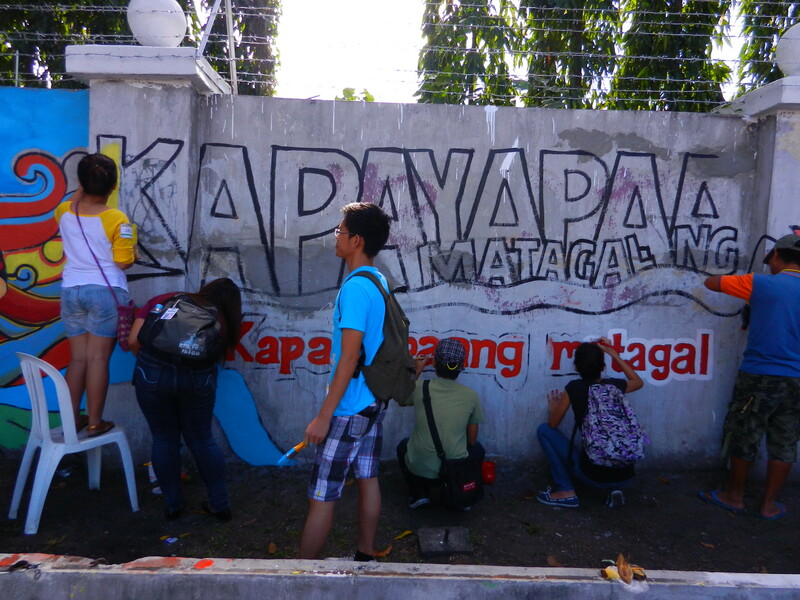 After announcements and instructions, painters adjourned to their assigned wall sections and began splashing color onto Camp Aguinaldo’s wall. They ran up and down along EDSA carrying cups of various paints, a flurry of excited little rainbows darting by the road. Hundreds of hands dipped brushes and dabbed, flicked, and flitted them across the cement walls. Colorful life appeared in spots and strokes… like a brilliant picture trying to put itself together: Large doves flying by signs of peace. A soldier taking a flower from a civilian, mimicking a scene that occurred decades ago at that very spot. Women weaving long red and blue waves – a representation of peace – that undulate across all paintings, tying them together. It obviously ended up being an excellent work of art – something I don’t forget to stare at as I pass by Camp Aguinaldo. Well, there was a whole family clad in orange, spending Sunday painting messages of peace and teaching each other the true value of community and kinship. There was a squad of uniformed soldiers taking time off to draw symbols of their sincerest desires for the end of armed conflict. A diverse mix of volunteers sat in the shade sharing stories, bottles of water, and pastel – a halal meal popular in many parts of Mindanao. There was a young man fetching a can of Red Bull, ice cold and freshly opened, for a sleepless artist he had never met before. 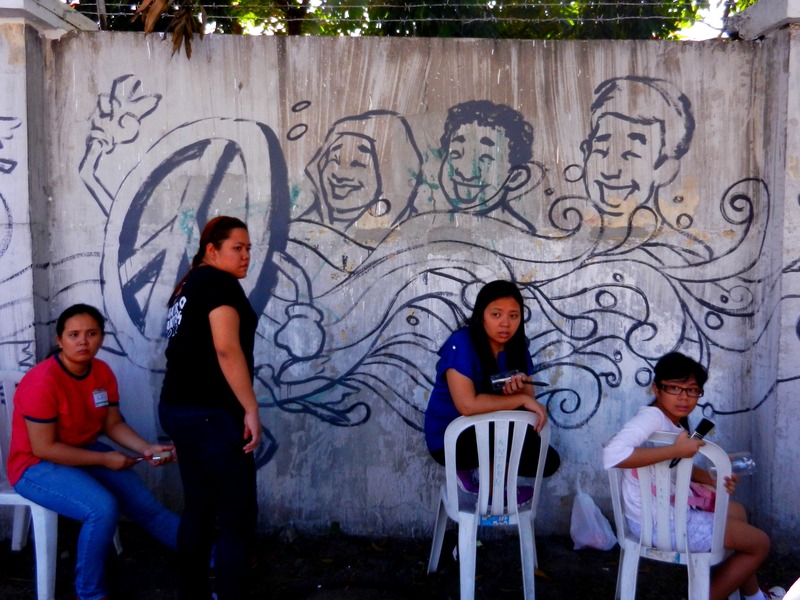 There was a reverse corporate totem pole: a group of ladies standing on men’s shoulders (for a change), finishing their artwork on higher portions of Camp Aguinaldo’s wall. There was the Philippine rowing team, soldiers themselves, carrying a few of the PWD’s over ledges and obstacles to get them closer to their cement canvas. Let’s not forget the 11 year-old boy, who gave a moving speech on peace and then proceeded to paint different sections of the wall from the beginning of the morning until the first few drops of the late afternoon rain which concluded the day’s events. His smile was so youthful and exuberant that volunteers still smile remembering him. At day’s end, what was left were two things… a wall made vibrant and a team of hundreds of people with streaks of colors all over their bodies like veins pumping shades of devotion. As the raindrops fell to conclude Leg 1, there the volunteers stood. A blend of sweat, road smog, water-based paint, and broad grins. Slightly sun-burnt faces lined with greens and blues; knees coated by the browns and grays of soil and dust; fingers soaked in black, red, and yellow… tired from carefully caressing love into the mural. There they shone… the brotherhood of paint. For our Throwback Thursday post, we stretch back to last December 8, 2012, when we visited the GreenEarth Heritage Foundation, a non-profit that bills itself as the combination of a farm, a burgeoning reforestation site, and a sustainable agricultural development set in the rugged backdrop of the Sierra Madre mountains in historic San Miguel, Bulacan. GreenEarth reached out to iVolunteer last year in search of volunteers and, lo and behold, was able to get connected with the Adventurous Friends – a group of young men and women who came together to heed the call of volunteerism. Their first visit to the site is documented here, on GreenEarth’s Facebook page, and it warmed our hearts that they continued returning to GreenEarth in the succeeding months to give back to the local community there. We decided to join them during one of their trips that December, together with our friends from Eko Adventure (an adventure club of a big consumer goods company). The video below recounts the insights and lessons learned by iVolunteer’s Core Team at the time, right after the outreach activity with GreenEarth concluded. Carlos Lasa, Director of Marketing & Communications: Ako, I lost something today — I actually lost my Frisbee kasi kinuha [siya] nung mga [GreenEarth] kids, pero okay lang. In exchange for the Frisbee, I gained a lot of things. I felt fulfilled reaching out and helping the local community here, and [marami akong nakuhang] insights as to how we can help, how there’s so much more that we can do as iVolunteer for the Philippines. JB Tan, former Director of Solutions & Technology: I was reassured that […] iVolunteer is headed towards the right direction. Today we had […] Adventurous Friends — they started coming to GreenEarth because of the [iVolunteer] portal. They learned about the opportunity dahil sa iVolunteer. At the same time we saw that, since Adventurous Friends started coming to GreenEarth, we saw some progress. So it’s a win-win between volunteers and organizations. We can do this! Clarissa Martin, former Partner Relations: For me, […] never give up on your dream. […] Dream natin is to bridge the gap between organizations and volunteers, […] and I know medyo mabagal yung progress natin pero we’ll get there, […] maraming umaasa sa atin! Mavic Agbisit, former Internals/HR: We’re here […] sa GreenEarth, tapos for me, amazing siya na experience, amazing to see how it works in real-life. […] Madali siyang sabihin, but then to really spend your time here and really work ([kahit] hindi naman full-time) pero that much effort, sobrang amazing to see people who are really into that. And inspiring as well, for us to be able to know or acknowledge na pwede pala talaga. So if you really want it or if you have the passion then you can do it! So volunteer!! Joana Tan, former Director of Marketing: Welcome to GreenEarth! […] I think [this is] really working, where iVolunteer connects people like Adventurous Friends the organizations that need [help] like GreenEarth and of course beyond the volunteers we also spread awareness [for the] other things [that] they need. I think that there’s a need for that role, for people to really connect to meet the needs of [organizations] kasi it’s more of communicating and finding the right match. Para kaming matchmaker ng mga organization and those who wants to help!